Q: How do I ensure perfect positioning during my guide rail installation? A: Here is a simple method that will give you hands-free access for easy drill hole marking. Close up of guide rail installation clamping technique. I love helping people problem solve their guide rail fabrication. I get asked this specific guide rail installation question all the time. Here is a alternative technique to the one I showed in my DIY Guide Rail video series. A picture is worth a thousand words, so I’ve included two photos that I think say it all. (Click any photo to enlarge.) When you are ready to install your new guide rails, here is an easy way to get your angle iron and tubing positioned so your hands are free to mark exact drill hole location. 2 pieces of stout straight wood. 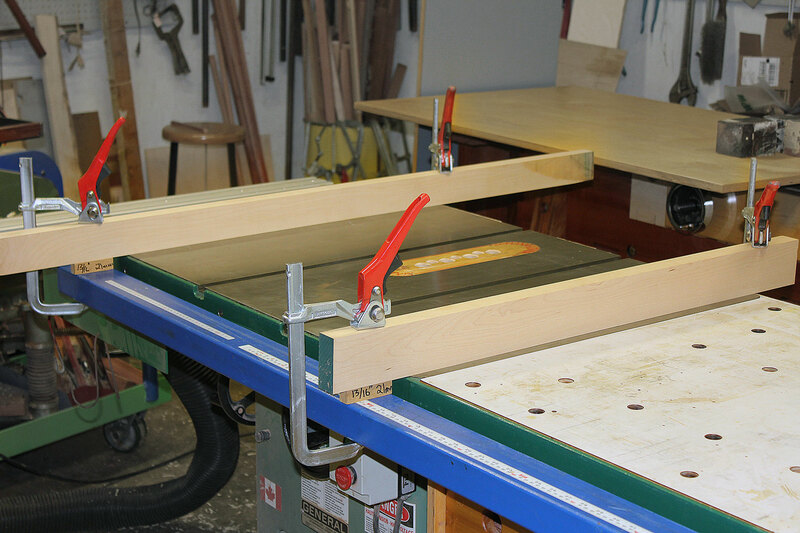 They should be long enough to span the depth of your table saw and guide rails. This simple set up positions the tubing and angle iron in the proper location for permanent guide rail installation. The 13/16″ (21mm) step down spacer is the exact dimension (as set by Biesemeyer) for installing Biesemeyer style guide rails. 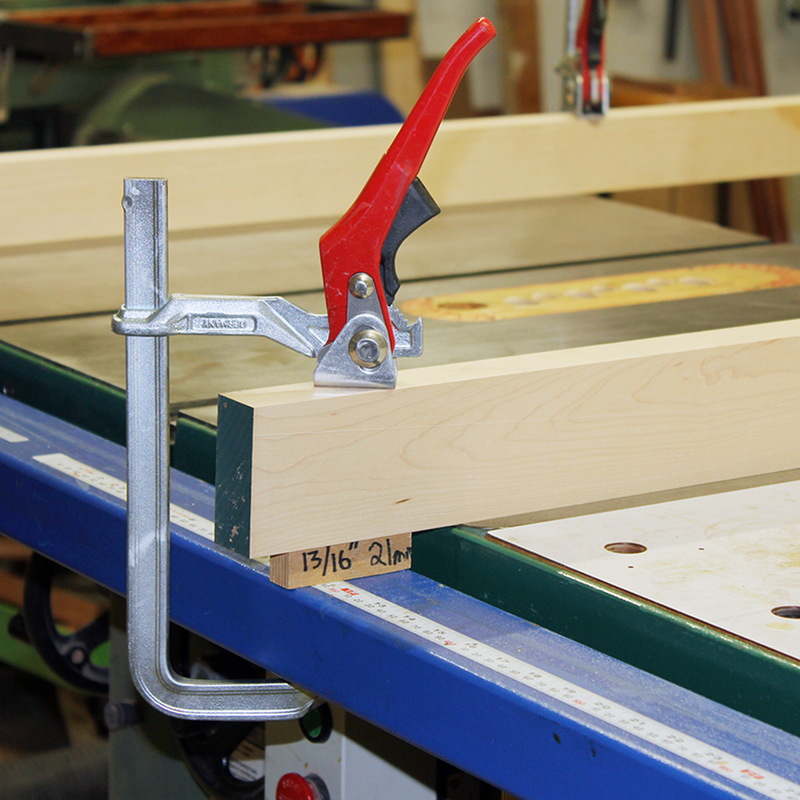 Clamping down these boards with pre-sized spacers holds the heavy angle iron and tubing securely. This allows you to work hands-free to mark your drill holes for perfect placement. Place the two boards as far apart as possible, but be sure to keep them on the cast iron (or granite ,or metal plate) portion of your table, for stability. To attach the angle iron to the saw I used 5/16″ counter sunk, grade 8 bolts, 1.1/4″ long. To attach the tubing to the angle iron I used 1/4″-20, grade 8, cap head screws, 3/4″ long. NOTE: A hex bolt would work just as well. Visit the VerySuperCool Tools Flickr album: Guide Rail Installation to see even more photographs. AskWoodMan’s Guide Rail Installation Set-Up.